Amazon has become the latest major retailer to embrace Apple's ARKit, with an update to its iOS shopping app providing its customers the ability to see how a selection of its products will look within their home using augmented reality. The AR View within the Amazon iOS app uses ARKit to overlay a rendering of a product from the retailer over the iPhone's rear camera. The virtual item is placed on a flat surface where the customer intends to put the real product, with it able to be repositioned and rotated to the user's preference within the app. To activate the option within the app, users have to press the camera icon at the top of the app interface, before selecting AR View. The app will provide a list of the "thousands" of virtual items available to preview within the mode, including furniture, electronics, games, home decor, and other products. 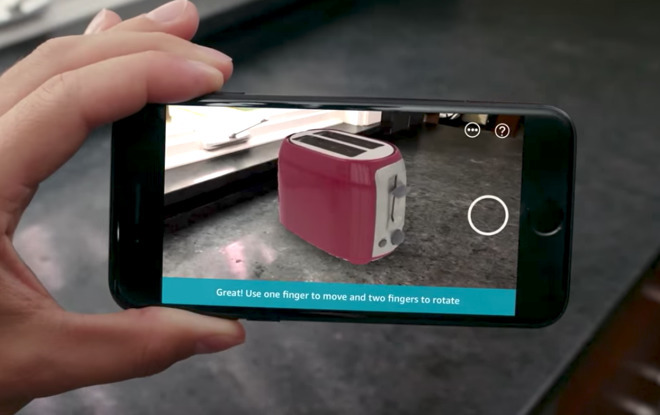 The addition of AR to the app "helps customers make better shopping decisions," claims Amazon, by "allowing them to visualize the aesthetic and fit of products in their own living space." The AR View feature in version 9.21.2 of the Amazon app is compatible with the iPhone 6S and later running iOS 11, which includes ARKit. The update's release notes reveals it is currently only available for customers based in the United States, but it is likely to spread to other markets if it is well received. Amazon's entry into the AR space follows after a similar product previewing app from furniture retailer Ikea. Released in September, the Ikea Place app also uses ARKit to superimpose its furniture on a view from the iOS device camera, giving users a good idea of how it will look and fit within the room before committing to a purchase. Introduced as part of iOS 11, ARKit is a framework designed to make it as easy as possible for developers to add AR experiences to their apps. Using the rear camera feed and CoreMotion data, ARKit is able to determine surfaces that objects can be placed upon, track camera movement in relation to the environment, and also determine the appropriate lighting for virtual objects placed into the scene.